Ever since its second video dropped in 2007, the popular animated web comedy series “How It Should Have Ended” has been delighting fans with their Star Wars spoofs. Beginning with “How Stars Wars Episode IV Should Have Ended“, the series has created episodes for every single live action Star Wars film. Their latest spoof – “How Solo: A Star Wars Story Should Have Ended” – debuted in September. Largely finding its humor from the film’s troubled production and oddness in the Star Wars canon (Lando performing a cover “This is America” in tribute to Donald Glover, Han commenting about how he feels fatigue, and even Ron Howard making an appearance), the episode of the long running web series stands up with the rest of its Star Wars tributes in terms of humor and overall quality. First noticed on January 15th and as of March 26th, 2018, “How Solo: A Star Wars Story Should Have Ended” is no longer posted on Youtube. A visit to the videos page for “How It Should Have Ended” still features evidence of the its existence, however. “How Jurassic World Fallen Kingdom Should Have Ended” and “How Spider-Man 3 Should Have Ended (Remastered)” are labelled as, “S10·E24,” and “S10·E26,” respectively. The series’ Solo video was episode twenty-five of their tenth season. And while there is still a review for Solo featured on the YouTube page, the actual “How It Should Have Ended” episode remains inexplicably missing. Scavenger’s Holocron reached out to How It Should Have Ended for a comment but as of this article’s posting has not heard back. If this changes we will update our article accordingly. This is not the first time HiSHE has unexpectedly taken down a video. Their 2014 video “How Frozen Should Have Ended” originally featured characters singing the film’s hit song “Let it Go” which was considered a, “performance,” of the anthem. A reissued version was uploaded on June 4, 2014 with different lyrics. It would be surprising – however – if HiSHE’s Childish Gambino spoof “This is the Falcon” was the reason for the removal, as the entire series has made a habit of spoofing popular music with thematically appropriate lyrics (enough so that they have released a full album of such songs). YouTube has notably had less tolerance for videos with copyrighted material for a few months now, notably when CinemaSins was forced to reissue “Everything Wrong With Star Wars: Episode VII – The Force Awakens” this past September when the video was originally posted in 2016. 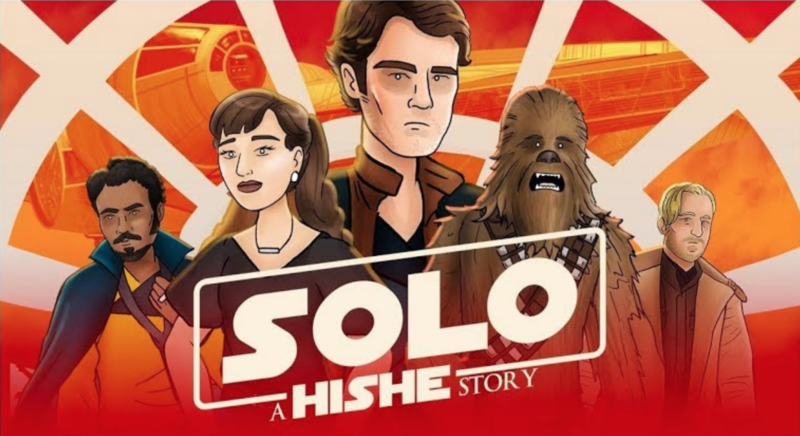 This still does not explain why “How Solo: A Star Was Story Should Have Ended” was removed and not any of HiSHE’s other Star Wars content (of which their is plenty), including their review for the film which utilizes footage under the same fair use laws that the entire web series finds legal safety under. As of right now, How it Should Have Ended has not reissued their video and there has been no official word as to why it was taken down in the first place. If you have any theories, feel free to share them in the comments below. Until then be sure to check back in later for any updates on this issue.